In many ways, the M.I.T. 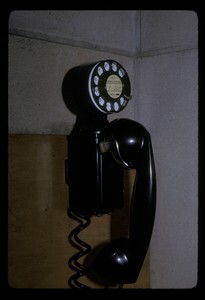 Dormitory Telephone System (“Dormphone”) originated in the Electrical Engineering Department, as that department employed two of the key figures in Dormphone history, Professor Carlton E. Tucker and Frederick E. Broderick. It is highly probable that a 50-100 line automatic telephone system was installed in the EE Department in the 1920’s. This was followed in 1930 by the installation of a manual switchboard in the East Campus dormitories, and later in the 1930’s by a similar installation at the Graduate House. The Graduate House was later named “Ashdown” in honor of Avery Ashdown, its longtime House Master, and will be referred to henceforth by that name. Automatic switching of dormitory calls began in 1949 with the installation of an Automatic Electric Company 300-line dial system in the new Baker House Dormitory. 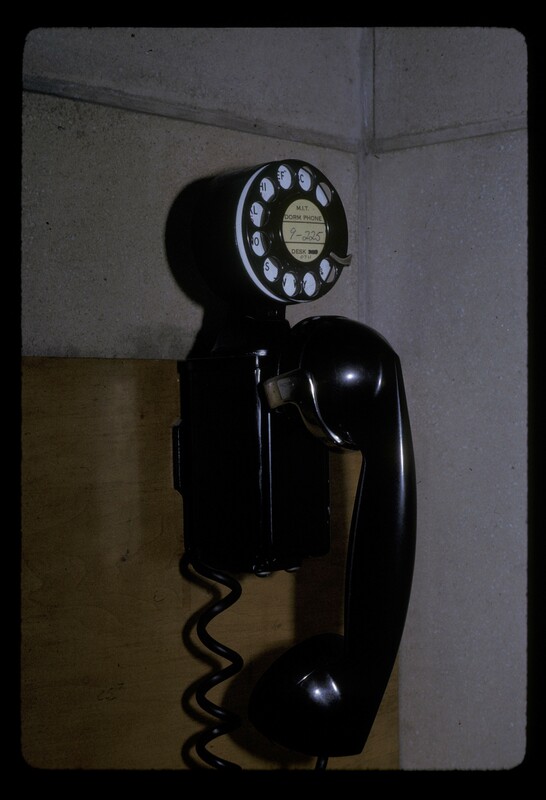 A telephone of the style used in Baker is shown in the photo, although the photo was taken in the Building 7 lobby.